Malachite specimen, showing the original botryoidal form & a polished face of the opposite half of the specimen Mines in the vicinity of Kolwezi supply much of the polishing-grade malachite in the world. 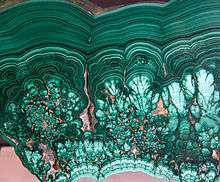 Another spectacular Malachite specimen from Katanga, on display at the Royal Ontario Museum. Antoine Gabriel Kyungu wa Kumwanza, Former governor of Katanga. Lunda Bululu, Former Prime minister of Zaire. Mastaki Nyembo wa Bazila Mpuku, councillor. Modeste Kaisa Londwe, Civil Society. 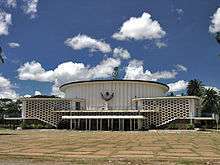 ↑ "Katanga: Fighting for DR Congo's cash cow to secede". bbcnews.com. 11 August 2013. Retrieved 12 September 2013. ↑ "Constitution de la République démocratique du Congo: Article 2". Wikisource. ↑ "COPPER". congo-pages.org. Retrieved 23 October 2015. ↑ "Katanga: le budget 2011 s'élève à 396 milliards de Francs congolais". Radio Okapi. 21 September 2010. ↑ The State vs. the People: Governance, mining and the transitional regime in the Democratic Republic of Congo (PDF) (Report). Amsterdam, The Netherlands: Netherlands Institute for Southern Africa. 2006. ISBN 90-78028-04-1. ↑ "History: dead link". Katanga Mining. Retrieved 16 November 2011. ↑ "An Independent Technical Report on the Material Assets of Katanga Mining Limited..." (PDF). SRK Consulting. 17 March 2009. Retrieved 6 November 2011. ↑ English-speaking School of Lubumbashi (TESOL), page from 2007, Internet Archive, Accessed 3 March 2013. 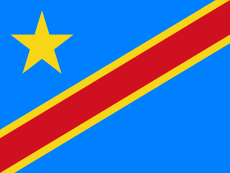 ↑ "DR Congo eyes a greater share of its mineral riches". BBC News Online. 22 April 2012. Retrieved 22 April 2012. ↑ "Scores killed in DR Congo train crash". Al-Jazeera. 23 April 2014. Retrieved 23 April 2014. 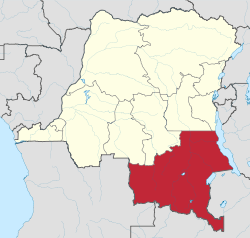 Wikimedia Commons has media related to Katanga Province.